This recipe is vegan, gluten-free and DELICIOUS! Squash is so good for you and now that we are deep into autumn, at least here in Toronto, all of the beautiful root vegetables are taking over! 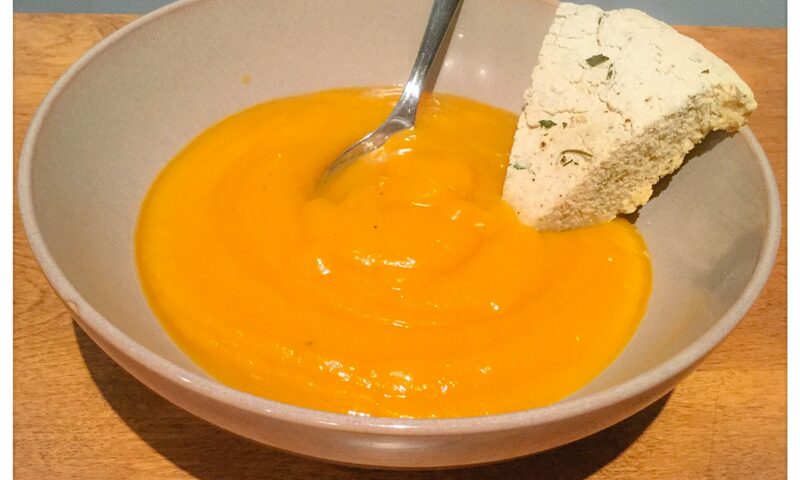 Here is a simple soup that you can make and freeze or make it, throw it in your slow cooker or on the stove and simmer for the afternoon and then enjoy it with a delicious piece of Roasted Garlic and Herb Flat Bread, you can find that recipe here: https://fuelgoodness.wordpress.com/2016/10/04/roasted-garlic-and-herb-quick-bread/. Preheat oven to 325°F. Line two baking sheets with parchment paper and spread out the peeled and chopped squash and chopped red onion on the baking sheets. Roast in over for 1 hour and 30 minutes or until golden and soft. Once squash and onion are roasted let them cool a bit and in two batches, using an immersion or regular blender blitz them up with the ginger, garlic, vegetable stock and salt and pepper until smooth. Once your mixture is smooth simmer in a slow cooker or a pot. If your intention is to freeze the soup, freeze after blending, don’t bother simmering. If your intention is to freeze the soup, freeze after blending, don’t bother simmering. Once you are ready to enjoy, heat the soup slowly in a pot. Roasting garlic is the easiest, most thoughtless thing. Roasting garlic takes away the intensity and leaves you with a sweet, spreadable deliciousness that you can add to everything, from hummus to flatbread or focaccia to soups and dips. Take you whole bulb of garlic and cut the top off (not the root, the other side), just enough so you break through the garlic skin and you can see the tips of the cloves. Put your bulb root end down onto a piece of aluminum foil. Sprinkle a tiny bit of canola or sunflower oil on the top of the bulb, over the tips of the cloves. Wrap the garlic up in the foil, like a little pouch, and put it into the oven at 300°F for 45 minutes to an hour. Take out of the oven and let cool before using.